The EBCO UCR 30 is the answer to traffic congestion, stressful commutes or enjoyable leisure cycling. Available in roadster and low step frames. The UCR 30 ebike uses the reliable TranzX motor system, components and batteries resulting in a quality ebike at an affordable price. It uses market-leading technology and componentry you would expect to find on a much more expensive e-bike. 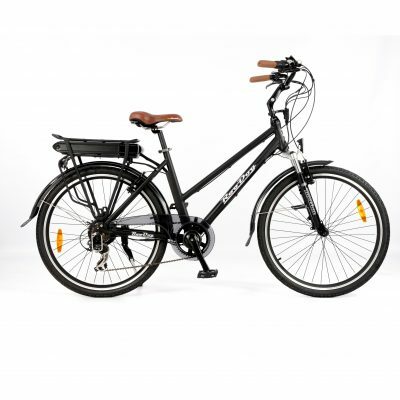 This bestselling e-bike incorporates CanBus/Logix computer diagnostic capability giving you more efficient and accurate information from your EBCO service. This ebike delivers a hi-torque quieter performance and is powered by a 36 volt 400wh lithium-ion battery. This gives a range of 30-50 miles* of enjoyable ebike riding between charges. Batteries can be charged on the bike or unlocked and removed and will take five-six hours to charge from flat. The Spanninga front light and Comus rear light are powered by the ebike battery. The weight of the bike is approximately 24kg including the battery. There are four modes of pedal assistance and Shimano Altus 8 speed derailleur gears. Aluminium double wall wheel rims and a choice of 26” or 28″ Kenda K-Shield puncture resistant tyres give a good combination traction on the road and long range by reducing friction on the road.